Note: this article is based on Morinosuke Kawaguchi’s lead article for Nikkei Electronics’ June 11, 2012 edition. As companies are looking for the future of engineering, one of the trends that has emerged is frugal engineering, a term that is best reflected in India’s national strategy where Tata reduced the Nano car to its minimum to make it available to the large share of Indians who could otherwise not afford an automobile. Frugal engineering is able to tap into otherwise unexisting markets. Morinosuke Kawaguchi finds the opposite movement of frugal, one much more fitted to cater to the needs of the industrialized markets, in what he calls gentle or yasashii engineering. Gentle engineering is crystallized in the world of the herbivore male, and its keyword is sustainability. The surface phenomenon of sustainability is still ecology, but at the heart of lies a mentality change. The modern world, characterized by Kawaguchi by urbanization, high population density, financial well-being and the supremacy of the service sector over the agricultural and industrial, is basically about preservation of its status quo in a largely peaceful manner. Striving for a harmonious relation, not just towards earth and nature, but within your near-field environment, has become a mindset especially with the younger generation that has been brought up in prosperity. It is in this environment that the herbivorization of the society takes place. Herbivore behavior means non-aggressive, gentle, considerate; a personality characterized by what might traditionally be regarded as female qualities and is a social phenomenon that is especially prominent in Japan where the term “herbivore man” or Sōshoku-kei danshi has caused much controversy. In the modernized world as described, with its relative physical and personal safety, carnivore traits are disappearing – and may not even be wanted! A study by the University of Aberdeen’s Faceresearch Lab shows that women in prosperous, industrialized societies with a good healthcare system tended to find men with softer, slightly more feminine facial features most attractive. They were not looking for the warrior anymore who protects them in a world where one must fight for survival. They chose the guy whose face signaled social skills and the role of the caretaker and partner rather than the provider and soldier. And men themselves? The term metrosexual has been flying around for quite some time, the groomed male who takes care of himself not necessarily to attract women, but to feel good about himself. The male grooming market is growing rapidly, and cosmetics companies are doing all in their marketing power to ease the transition from carnivore to herbivore by advertising skincare products by utilizing tough male icons, symbols and celebrities just to say: It’s okay, don’t feel less of a man for using deodorants, shaving your armpits or applying skin lotion. 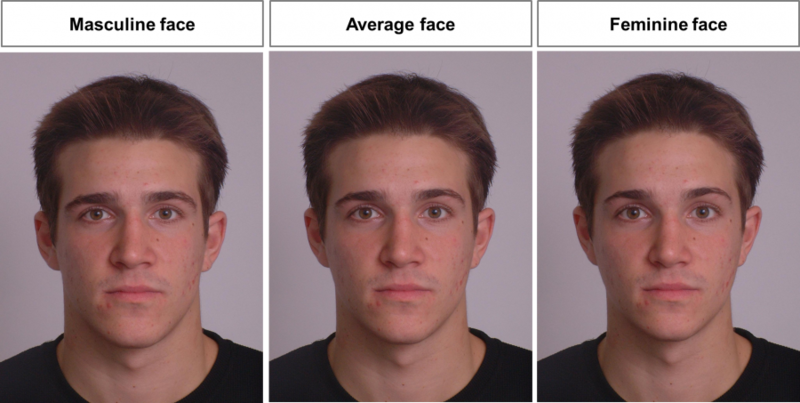 Three face alterations from the Face Research Laboratory study to evaluate women’s preferences. The image on the left has more masculine features like thicker eyebrows and a wider jaw, while the one of the right has softer features. If a society aims for prosperity, herbivorization is a natural consequence, says Kawaguchi. As China and Korea blame Japan and the West for having a “decadent” influence on their youth, Kawaguchi believes that herbivorization is a rather logical consequence of the four traits of modernization. As prosperity is reached the tough, carnivore spirit that was needed to attain it dissolves in the next generation. And it happens, undeniably, to any emerging country growing into prosperity. 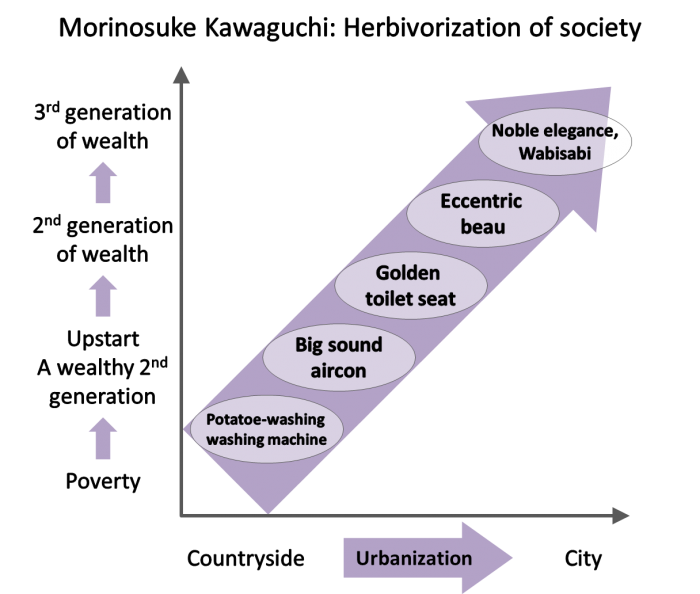 As illustrated in Kawaguchi’s chart, the “hungry” generation will approach products for their practical use, like e.g. women in China using washing machines to wash not clothes, but large quantities of potatoes. In India there is a perfect phenomenon to reflect the mentality of an Upstart generation, the generation of beginning prosperity that feels the need to show off as they are climbing up the social ladder. This is the reason why air conditioners in India is making a lot of noise: you want your neighbor to acknowledge you own one. What a difference from mature markets where the goal would be to minimize the sound! As urbanization as Kawaguchi defined it progresses, the taste gets more eccentric. At the same time, it enters not only personal spaces but also the deeper layered lifestyles. Cultures that have experienced a prolonged period of peace and prosperity have all given birth to herbivore trends and mannerisms. Japan’s Edo period saw the emergence of the “Kabukimono”, young males with an eccentric sense of fashion and behavior. As prosperity continues, the deepest layers are reached, and internalized. It is in these periods that products address deeper, complex mentalities and functional aspects fade into the background in terms of perception. Kawaguchi names Japan’s philosophical aesthetic concept of Wabi-Sabi as an example to reflect the needs of the inward-oriented 3rd generation. As frontiers of gender roles and responsibilities are blurring in the herbivore socities, it is then that new market opportunities appear. One has to just accept the evidence and look for the consequences, i.e. new business opportunities. A provocative example occurred in Thailand, where a public school decided to install a third toilet category for boys who would rather be girls and consider themselves transgender (a noticeable 10-20% of the male pupils). Kawaguchi, being pragmatic about this rather extreme example, advises it is this kind of hint that should be considered. Spotting and creating a new category always wins the race. So in this case, what should a toilet for the third gender look like? And if we now have toilets for men, women, handicapped and transgender, is there more we can do in the segment? If gender role frontiers are fading in herbivore markets – and it’s not only gender, but age, race or social status as well – are blurred, what kind of products can be (re-)designed? And this is where Kawaguchi’s concept of yasashii engineering comes into play. Yasashii design and engineering caters to the herbivore market, to the market of what he calls the “luxurious weak”. With a generation of herbivores that opposes war ans strives for win-win situations for all, the only other solution to live in an overpopulated works is sustainability and its herbivore mentality of preservation rather than conquest. And Japan is very, very herbivore, the most among the industrialized nations. Japan is the Time Machine accelerator for what is to come. Japanese are not even aware of this fact. They don’t see themselves as accidental models of the herbivorization. But then again, Japanese present-oriented subculture and its heroes in anime and manga strike a chord within the young generation worldwide. There is just something about the herbivore hero. Even the tough, masculine blockbuster superheroes are portrait with a much softer streak; they have more doubts, show consideration and talk about feelings! What a change from 50 years ago! In the sense of mental sustainability, Japan clearly is the industrialized country that has gone farthest down the road of inevitable herbivorization. It’s a pilot model, want it or not, and they don’t even know. And while Japan clearly loses again Korea in terms of localization (ability to adjust to the local market), it is far better able to understand the prosperous herbivore market of the luxurious weak. As much as consumers in emerging markets want to show off their prosperity, this goal is not as prominent in herbivore markets anymore. Herbivore consumers in urban areas that are growing to become so similar across the globe are looking for something else. This is the strength and opportunity of Japanese engineering. But the world is noticing this trend, too, and Japanese companies are slow in recognizing the potential at their hands to occupy the market of the herbivore. The implicit term “yasashii” can become a buzz word, maybe even stronger than Japan’s much more famous term “kawaii”, and according to Morinosuke Kawaguchi, the gentleness is directed towards everything: Gentleness towards yourself, towards your skin, towards your near field environment, towards the people on the other side of the globe (just think of young people’s Facebook solidarity movements in recent years). Gentleness can be a new direction just like frugal engineering is a direction for India. It is the key itself for sustainability. Opportunities in this acceptance are manifold.